Caring for and hatching snapping turtle eggs can be an extremely rewarding and fulfilling experience. In the wild, Mother Nature provides the eggs with all the needed essentials, but, with the correct tools and a little know-how, you can successfully care for snapping turtle eggs right at home. Prepare the plastic shoebox. Dip the vermiculite into clean water, and squeeze dry. Place the damp vermiculite into the plastic shoebox until it is about half full. Drill or cut a dozen or so small holes into the lid of the shoebox. These openings will help maintain the proper humidity while also allowing air to flow through easily. Transport the eggs to the shoebox. 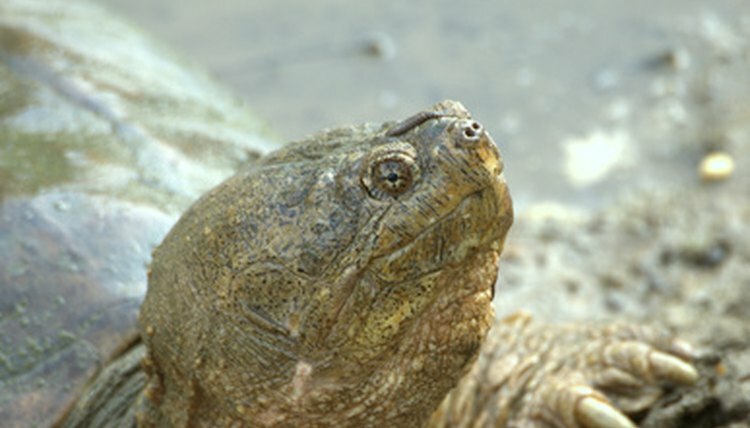 Take extra caution while unearthing the snapping turtle eggs. Carefully remove dirt from around the eggs with a paintbrush. Scoop the eggs, and place them on top of the vermiculite in the shoebox with a large soup spoon. Loosely cover the eggs with a bit more moist vermiculite, leaving about one-fourth of the egg exposed, and then close the lid. Place the shoebox into an incubator set at 78 degrees F. If you do not own a ready-built incubator, construct one from a 10-gallon fish tank. With the shoebox inside, fill the fish tank with enough water so that it comes up to about an inch from the top of the shoebox. Place an aquarium heater in the water, and set it to 80 degrees F. You will need a thermometer mounted inside the tank, but not in the water, to make sure the air temperature stays between 77 and 80 degrees F. Cover the fish tank with plastic wrap to help maintain proper temperature and humidity. Check the moisture content of the vermiculite regularly. Every week you will need to see if your substrate is maintaining the proper water content. A simple test is to lightly hold a small amount of the vermiculite between your fingertips. If your fingers are left slightly moist when you release the vermiculite, then you do not need to add any water. If not, lightly spray the vermiculite around the eggs with clean water. Do not spray the eggs directly at a close range. Move the turtle hatchlings into a more permanent habitat. Turtles will hatch in approximately 70 to 80 days. New hatchlings will emerge with their egg yolks still attached. They will be ready to move once they have completely absorbed this yolk. You can substitute a cooler or ice chest if you do not have a 10-gallon fish tank readily available. Ambient temperatures lower then 72 degrees F or higher then 90 degrees F can be fatal. Although baby snapping turtles are cute, fully grown turtles require a very large habitat and can be extremely dangerous to handle. Adam Flowers used his studies in computer science from Syracuse University to work as a PC consultant for nearly 10 years. Currently he is self-employed, running several e-commerce websites as well as a successful eBay business.